Heather Elliott (Youth Ambassador and Wooden Boat Board Member) and Crystal Braye (Wooden Boat Museum Folklorist). 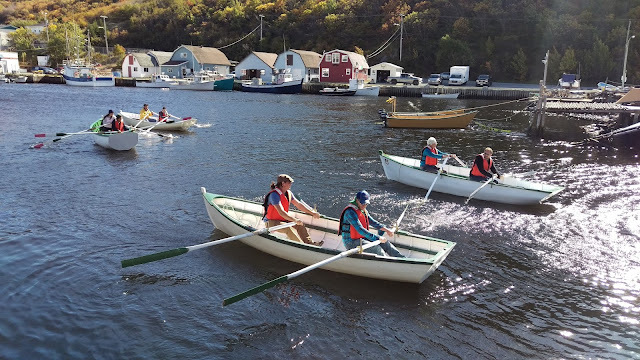 Last week the Wooden Boat Museum of Newfoundland and Labrador hosted Wooden Boat Heritage 2016 which was a three day event focused on the celebration and use of wooden boats and traditional skills. There were speakers from across the world – Basque Country, Connecticut, New York, Washington, Scotland, Nova Scotia, and many parts of Newfoundland. The speakers focused on different elements of wooden boats and gave presentations on how reconstructed wooden boats can celebrate the past and renew interest an interest in maritime heritage, how wooden boats can be used in experiential learning and in tourism, and how wooden boats can be used to teach youth new skills they can use in many aspects of their lives. Aside from the presentations about wooden boats there were also musicians who performed, and facilitators who moderated working groups to develop new ideas on how the Wooden Boat Museum should develop over the next few years. The highlight of Wooden Boat Heritage 2016 was the Heritage Skills Challenge in which participants, and youth volunteers learned how to use a variety of tradition tools and skills which would be used in building boats and fishing. The event took place in Petty Harbour and was organised in partnership with Fishing for Success. Here is a selection of photos from the event! Terra Barrett of the Heritage Foundation learning how to knit nets. Ema Kirbirkstis (Youth Ambassador) casting a net. Facing off in the adze challenge. Wooden Boat Museum Board Member Frank French and Eileen Matthews of Heritage New Perlican working together on the double ended saw. Adam Green of Rock the Boat and Youth Ambassador Emma Lang face off in the splitting fish challenge. Evelyn Ansel explaining how caulk a boat with oakum. Youth Ambassador Lisa Daly tying a withe (wiff). Which skill is your favourite? What would you like to learn?